This is a reread and as I go along I remember how I enjoyed this book. I’ve read many books set in India but this is one of the very best – there’s something about the setting that draws me. Adela Quested has come to Chandrapor, a small outpost in Eastern India, to meet her possible future husband, Ronny Heaslop, the very proper British city magistrate. Ronny’s mother, Mrs. Moore accompanies her. In Chandrapor they meet Mr. Aziz, a kind but somewhat befuddled Indian doctor, Cecil Fielding, an independent thinking British school teacher as well as a handful of other English colonists and Indian natives – each is different – perhaps representative of “types” Forster found while he visited the area. The story moves along rather slowly until something happens in the caves to which Dr. Aziz takes Mrs. Moore and Adele. But there is a lot of satire and irony in those pages and a build-up as to what happens later. And then after the trial the story slows to a snail’s pace again -revealing all the consequences of the event. 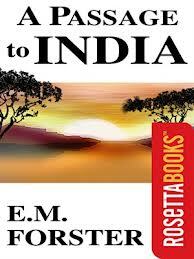 A Passage to India was written in 1924, shortly after his final trip to India. This is one of those books that I’ve been thinking for a while that I’d like to re-read. I’m not sure when I’ll fit it in but it keeps calling me. In other words, I loved it when I first read it and have read it a couple of times but it’s been a long time. BTW Historical fiction to me is fiction set in a time before it was written and, really, before the author’s time (ie not just 5 years before it was written!). Jane Austen’s books are not historical fiction, but Georgette Heyer’s are. I do think some people forget this when they read classics, as you say. Charles Dickens’ A tale of two cities is technically historical fiction … though I wonder if such distinctions were considered at his time. Must check out the history of historical fiction! A woman after my own heart! Yes, classics are not usually historical fiction – I’d say A Tale of Two Cities does fall in both categories, but that adds another dimension to the reading difficulty because Dickens was writing for readers of his own day, 70 years after the French Revolution. And his immediate readers lived close to 150+ years prior to the readers of today! Where Dickens explains some things to his intended audience, we need a lot more explained to us!